In the fall of 2013, John Byram, at UNM Press, received a call from a California man named John Douglas. 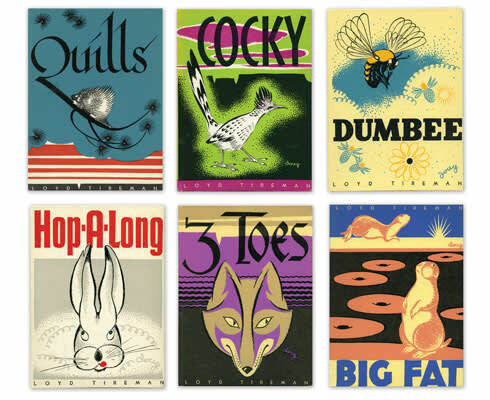 He was the grand-nephew of a man named Ralph Douglass, who had illustrated a series of children’s books for UNM Press in the 1940s. The family still had the original paintings and drawings made for the long-out-of-print books. Douglas proposed the idea of reissuing the stories. Byram went into the archives. “I was captivated by them,” he said. The Mesaland Series was not only the first children’s book series issued by UNM Press; it was the first children’s book series issued by a university press in the United States. To contemporary eyes, the books, each of which focuses on a different wild New Mexico animal, are beautiful objects. The eggshell-finish hardcovers open to reveal illustrations and typography that take cheeky liberties with conventional publishing practices. Sentences regularly go catawampus, words flung on the page like concrete poetry, in active relationship with the twitchingly expressive characters they describe. the Chicago Daily News, came, like many others, to New Mexico to improve his health. He and the author, Loyd Tireman, a pioneer in bilingual and community education, were both on the UNM faculty. At the time, cartoons were seen as a threat to the edifying reading practices expected of children. Tireman wanted the dynamic style of Douglass’ illustration to capture children’s attention, much like contemporary books choose to mimic screen-based reading. He began the project at the urging of the New Mexico Game and Fish Commission, which was trying to convince educators to teach kids about conservation. He was clearly able to do so without the kids’ noticing—so absorbing are the stories, in which the animals’ puckish dramas leap off the page. Like all classic children’s literature, the Mesaland Series retains its timeless appeal, and there’s no reason to think it wouldn’t charm today’s children into cultivating empathy for the natural world that so accessibly surrounds them.